The first arc of 'Hit-Girl' wraps up as only Mark Millar can and that's with all guns blazing! Amid all the bloodshed and explosions, Millar finds a beating heart and a new beginning. Four issue arcs can be hit or miss. Sometimes, it's not enough issues to develop characters sufficiently and still get a satisfying conclusion. While the main focus has been on Mindy coercing Mano to kill rival cartel members as well as his own, we finally get more info about the mysterious mother whose son was Mano's first kill. It's not a lot but enough to demonstrate how her pain, anger, and guilt led to hiring Mindy to get revenge. It ultimately leads to a surprisingly optimistic ending. There is a method to Mindy's madness and while she may be a psychotic vigilante killer she gets the job done. The elimination of two drug cartels is quite an achievement but it takes a lot of bullets and there's no shortage of carnage on display. That was to be expected so fans of this world and over the top ultra-violence won't be disappointed. What surprised me was Mano's character arc. Millar doesn't humanize the mob enforcer but I got the feeling that his life could have gone another way had he had the right influences and opportunities. Mano felt the cartel leader was a father-figure and the cartel his family. It's a sad reminder of how fragile and random our lives are. Mano could have been a real role model to his younger brother but instead, his brother is used as leverage to manipulate him into killing...everybody. Mano has to pay for his many sins though and even his sadness for the loss of his "family" can't redeem him. Ricardo Lopez Ortiz emerged as the perfect conductor of Millar's symphony. Ortiz thrives in the chaos, frantically penciling one firefight after another, constructing every manner of gruesome death imaginable complete with exploding skulls. He's a complete artist and storyteller as he moves the camera holding certain beats in the few quieter moments that resonate amid the noise. I imagine he's as gleeful as Mindy drawing her destruction on the page. Sunny Gho has to fill these scenes with color to convey a mood, emphasize the blood splatter, or create transitions in time and emotion and does it with ease. Melina Mikulic has her work cut out for her with not just dialogue but every "blam" from a gun and the many exclamations that heighten the tension. It's one giant artistic mosh-pit of comic book excellence. 'Hit-Girl' ends its first arc in Colombia with figurative and literal fireworks. Fans get their money's worth of violence and gore as Mindy's plan comes full circle. 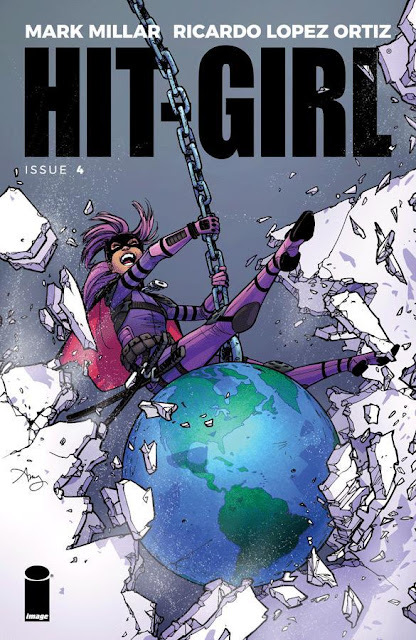 The new series is a wrecking ball to the globe like Amy Reeder's amazing cover. Mindy is taking over one country at a time bringing her bloody sense of justice to criminals everywhere. Millar has done it again.